If you haven't been there yet, be sure to view The Digital Group home page on my site! This picture page documents the restoration of a Digital Group "System", less circuit boards. 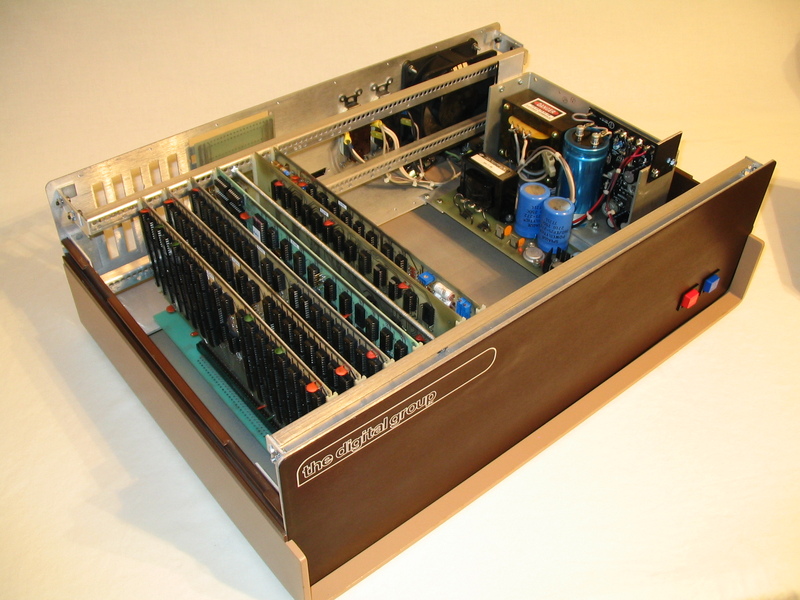 A Digital Group system consisted of a cabinet, a mother board--mini or standard, a low current power supply and a high current +5 Volt supply--of which three were available, and at least three circuit boards--CPU, I/O and Video & Cassette. The System Cards have their own page. My restorations consist of a complete system breakdown, cleaning, refurbishing, and reassembly. Sounds easy, huh? Just a guess, but it probably takes me around 200 hours to do what you see here. Good thing this is just a hobby! The restorations shown here are just two that I have done. Most of the photos are from a restoration I did in 2007 for another collector in trade for some DG equipment. The photos show the work from start to finish, though not in tremendous detail. The other restored system is shown completed only--no photos were taken of the work. I was busy, what else can I say? You can tell them apart by the power supplies. The second system went to a museum in Texas a few years ago, oh but don't worry--I still have good collection of my own! The power supplies in this system needed some close attention. The low current supply (the one with the silver caps) had an unusual power transformer unlike those I have seen from Digital Group. I concluded that this must be an after market replacement. Since originals are hard to come by, and since I have no extras on hand, I chose to restore this one by cleaning and painting it to look like the original. The results were quite good as seen in the photos below, the transformer was painted black and a duplicate of the original label was attached. Only a true DG snob will notice the fake! :) Then again, for all I know, it shipped from the factory like this--maybe they ran out of the originals. The other power supply needed a lot of work to clean up, but all went well. The red "Danger" sticker is a non-original, placed for safety sake. The system had some extra holes drilled into the back, and I thought, what the heck--I'll patch them! So I did. I taught myself to weld aluminum--still have some learning to do--but it worked well enough. The repair is almost unnoticeable in the finished machine. Visible in the pictures is the brushed aluminum finish that I do to clean up most of the cabinets I restore. Over the years, the cabinets loose that "new shine" from getting bumped around. I use a belt sander to re-brush the finish to like new. Painted surfaces are either stripped down to the bare aluminum and repainted, or just touched up with an airbrush depending on condition.